Meanwhile, of course, Apple continue to dominate the premium segment after the launch of the new iPhones in September. This divergence between low-cost and premium will no doubt spread across the rest of the global market as the downturn continues. And the main growth is likely to be in the low-cost area. India, for example, saw volume grew 5% versus Q3 2017. But with average per capita income less than $2000, price is all-important. Reliance Jio’s ultra-low pricing strategy has been critical in making bandwidth affordable, and there are now over 400 million smartphone users in the country. 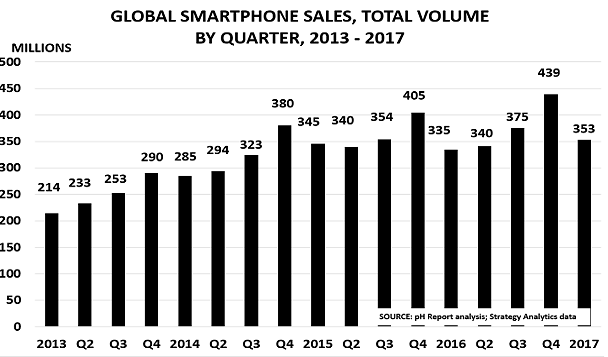 But iPhone sales are actually falling, and will be down by a third to just 2 million this year. Functional phones in the $150-$250 price segment are driving sales growth, via online sales. Q4 is expected to see these grow 65% to reach 50 million, due to their 50%-60% discounts. Instead, the market is segmenting again on the basis of price or perceived value. Chinese players compete on price, while Apple focuses on profit and is moving up-market. this means that previously profitable market leaders such as Samsung are slowly disappearing along with the mid-market segment that they supplied. 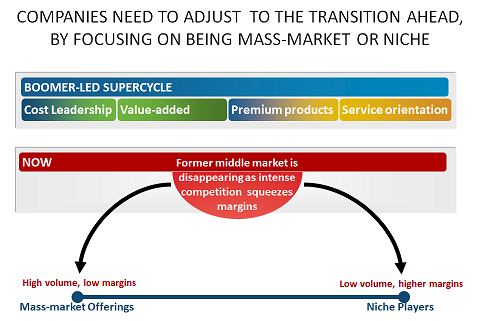 These very different strategies highlight the new world ahead for consumer markets and those who supply them. Samsung are most at risk at the moment, as they recover from the Galaxy Note 7 problems. Their sales fell around 60% in China – the world’s largest market. They are now launching the new Galaxy S8 model to rebuild their position, but will also face strong competition in H2 with Apple’s 10th anniversary iPhone. 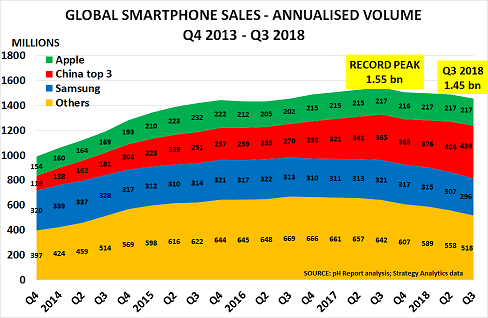 The same process of consolidation has, of course, already played out in the smartphone software market, where Google’s Android system is now the dominant player. It has 86% of the market, with only Apple’s iOS system (14%) still competing against it. Apple therefore has to get everything right with the 10th anniversary iPhone – if it fails to excite, then Apple’s entire business model of combining hardware with software will be at risk. Chinese manufacturers are therefore likely to be the major winners in the future. Their individual positions have changed over the years, as fierce competition took its toll on companies such as Lenovo and Xiaomi. 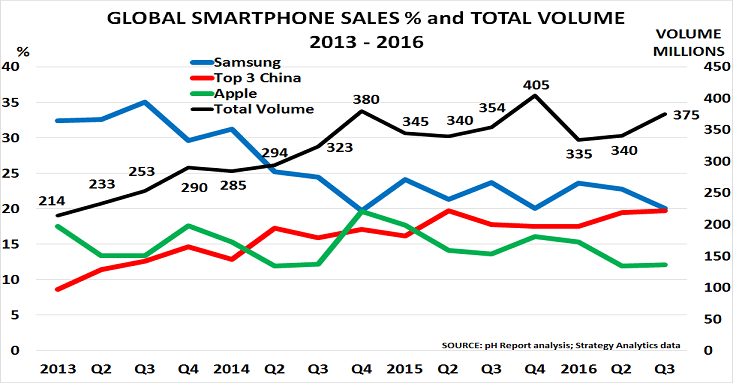 But as the second chart highlights, Q4 suggests the Top 3 Chinese players are now starting to collectively outsell both Samsung and Apple. The issue is that 3.1bn people now own smartphones, and the other 4.2bn can’t afford them. So inevitably, the market is going to focus more and more on price. Of course, millions of people will still want to own an iPhone or Galaxy. But especially as the world moves into recession, price will become the deciding feature for many people. □ China accounts for around a third of global smartphone sales, and Apple’s Q4 revenue was down 12% in the Greater China region. This highlights once again its failure to introduce a more competitively priced model to compete with local suppliers. □ Apple’s position in India, the other key emerging market, is even worse. As recently as 3 years ago, Apple had planned to be selling 10 million iPhones in India by now. But as in China, its insistence on maintaining Western pricing models means its growth has stalled. Apple sold just 800k-900k iPhones in Q4, and like other manufacturers has been badly hit by premier Modi’s demonetisation programme. Most Indian phones are bought with cash, and Apple’s sales have since collapsed by 30% – 35%. This is also a major issue for the entire industry, which had been expecting to profit from the launch of Reliance’s new Jio service. This offers free 4G data service until the end of March and has already gained 72 million users. □ Sales in other major markets have clearly plateaued. W Europe was down 3% in Q4, with Germany and France down 10%. The US only managed a 3% rise, after a fall in Q3, despite high levels of promotional activity. Russia stood out with a 10% rise in demand in 2016 as the currency stabilised with the oil price. But sales in Latin America were down 1%, and the Middle East/Africa was up just 1%. Essentially the market has now become saturated, with price likely to become the main competitive weapon. Samsung and Apple may hope for some gains as 4G and 5G networks are rolled out, but 2017 is likely to see profit margins under pressure from Chinese competition everywhere – for manufacturers and their suppliers. 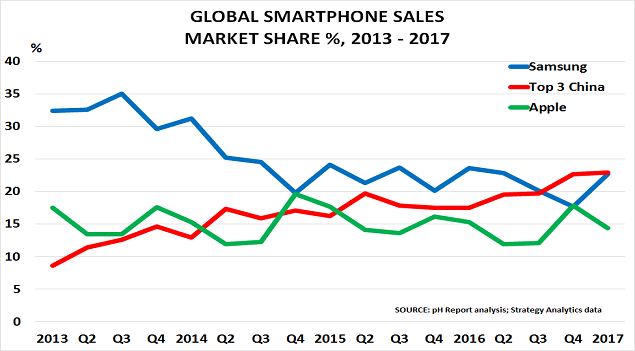 The global smartphone market reached a fork in the road in Q3, and that was before Samsung’s disaster with the enforced recall of the Galaxy 7 model. What happens next is not yet clear, but it is likely that a focus on price and affordability will come to dominate. In turn, pricing pressures on suppliers will intensify. The market has become saturated, and the range of new features has been relatively small. 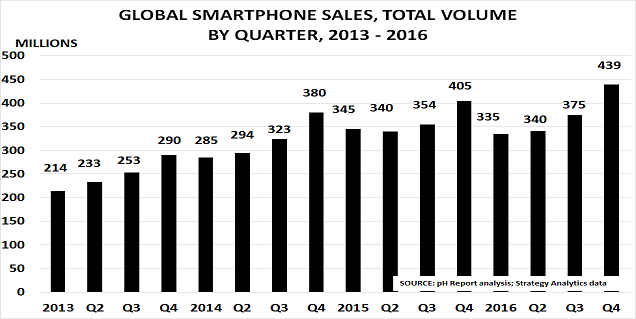 Globally, the smartphone market has peaked, as the 4.1bn people without phones cannot afford the internet”. Even more interesting, is that competition is intensifying from the bottom end of the market, as Strategy Analytics note. The top 100 Microvendors saw their combined share rise by 27% in Q3 to take a 15% share of the global market. Over the same period, the share of the Top 30 manufacturers rose by just 3%. This is good news for consumers, who benefit from new features and increasingly cut-throat competition. But it is not good news for suppliers to the industry, particularly those supplying more standard parts. As Reuters reports, they are suffering from “unprecedented pricing pressure”, with even Apple pressuring suppliers for lower prices as its volume growth slows. The market is set to get even more competitive as companies fight to profit from Samsung’s problems. Affordability will clearly be the key factor. But companies such as Huawei are also adding new features to lure consumers – such as a memory facility, that enables the phone to automatically put most-used apps within easy reach. This will challenge Apple as well, whose users currently have to reorder apps manually to suit their needs. 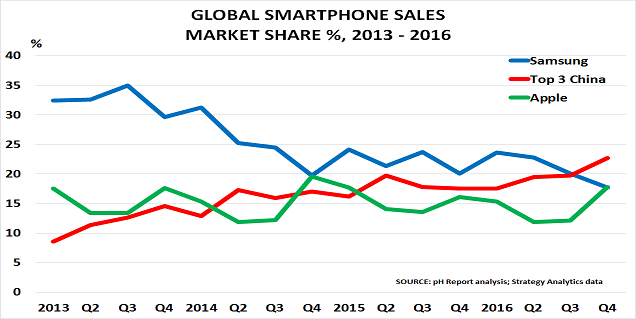 2017 may very well see a bloodbath develop as Samsung tries to regain its market share. And who knows what will happen once President-elect Trump’s protectionist agenda starts to be implemented.